As a teenager, Edda Mussolini wasn’t a beauty but she had a strong personality. She was confident, bold and always looked into a man’s eyes when talking to him. She was also one of the first Italian women to drive a car, would wear makeup, trousers and, at the beach, skimpy swimsuits. She was different from most women of her era and, because of this, men would find her very charming. And she was now old enough to date. But her father kept a very close eye on her, which became easier when the entire family, after the birth of the Mussolinis’ youngest daughter Anna Maria, moved with him in Rome. Despite Benito and Rachele living in different parts of the same house, this gave the children the opportunity to spend more time with their father. But Mussolini had also ordered the police to watch over Edda and keep him informed on her relationships. Whenever she dated someone he considered unsuitable, he would put an end to the relationship. Edda liked to flirt with men but this wasn’t the appropriate behaviour for a young girl and could damage her father’s political position too. To put an end to it, it was decided Edda should get married. She first got engaged to Pier Francesco Orsi Mangelli, the young son of a noble and rich industrialist. At first the couple seemed happy but pretty soon they realised they weren’t made for each other. Pier Francesco didn’t like Edda flirting with men and she found him boring and pedant. Despite her engagement, Edda started dating another man. He was a Jew. At same point, Edda even wanted to marry him. When Mussolini found out, he was outraged and furious. He ordered Edda to stop seeing him but she didn’t obey and kept seeing him in secret, at times using her chaffeur-driven car to go and meet up with him. Mussolini then threatened to stop allowing her to use the car and she finally gave in and damped her lover. It seemed that she could live without him but not without her car. But her engagement came to end too when Pier Francesco asked Mussolini how big Edda’s dowry would be. Benito furiously replied her daughter wouldn’t have a dowry and told him he never wanted to see him again. The search for an appropriate husband for Edda started again. Who would she marry? At some point, some American newspapers suggested she was engaged to the Italian crown prince Umberto, but if this match was really ever even considered, nothing came of it. Instead, the choice fell upon Gian Galeazzo Ciano, the son of Costanzo Ciano, the minister of Communications and a follower of Mussolini. The Ciano family was both powerful and rich. Galeazzo and Edda were introduced by a common friend, Resy Medici, at a party. The couple danced for the entire night. It was clear they liked each other and decided to meet again. Three days later they went to the cinema. While watching White Shadows Of The South Sea by Robert J Flaherty, Galeazzo all of a sudden declared his love to Edda and proposed. She accepted. Her father was really happy when she told him she was engaged while her mother Rachele wasn’t very enthusiastic. 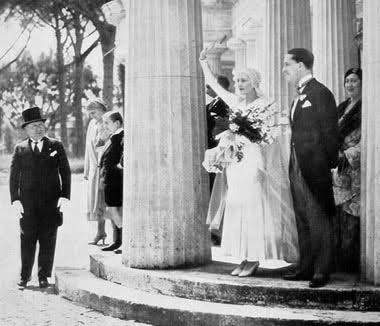 On 15th February 1930, Galeazzo officially asked Mussolini for his daughter’s hand in marriage. The wedding took place only three months later on 24th April. Edda was now Countess Ciano.